I picked up a 1870’s Arab printing press this weekend. Heavy thing. Thanks to the guys at City Press in Brechin for helping out. The printing press will be used as part of our Co-op in Orkney. All it needs is some ink and some new roller cores, for which I am hunting around right now. 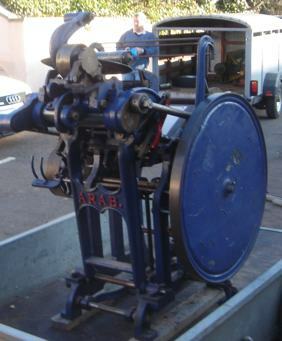 The Arab treadle press was one of the most common presses a hundred years ago. 40,000 were made and they are considered the best of their kind in the world. We are totally buzzed to have it and cant wait to start treadling. Great stuff Andrew. Do you have type, stock, furniture etc for this machine? How cool! I just started to learn how to make books. Do you have any printing projects laid out? Is a source of rollers for Kelsey presses. Perhaps they will fit yours? A hint – don’t clean the rollers with gasoline, it’s not good for them. Hope you got your Arab press running. I have just got my hands on one too! I’m just wondering if you managed to find a source for rollers and roller cores etc..? I would greatly appreciate any info or contacts you might have as I am a pretty much a complete novice at letterpress. I have a 19th-century Arab, in full working order, and plenty of trays of type. I need to make more room and so offer it to a suitable home for the price of carriage. I am based in Oxfordshire. I am very interested in the ARAB press, I have attempted to make contact via your Clutag e-mail. I would be grateful if you could contact me to discuss this further. Thanks. Andrew whose blog this is has expressed an interest and i was reserving the Arab for him, but as he says, he really wants to cannibalise it. I would prefer it to have a working life. I am not selling it, but it goes to the best home that would bear the cost of collection and carriage. Let me know via my email address what you would like to do about it. I live in Oxfordshire. Thanks for your reply, I have e-mailed you at Clutag. You have a new press… I have press envy. Hello, just a note to say enjoy, as a press may be heavy but it can make a heart feel light. I am from across the blue in New England, Maine to be more specific, preparing for a print exchange with printers from Orkney. Exciting things, presses. Best of luck to you.